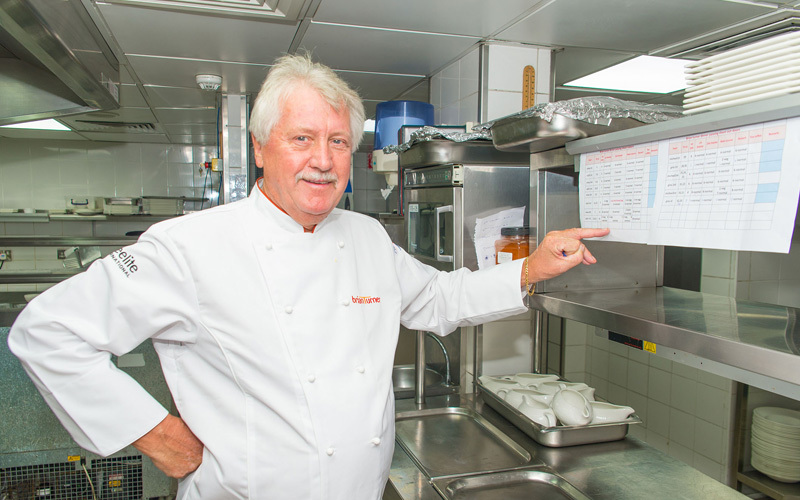 British chef Brian Turner has not only has dominated the food scene in London (he earned a Michelin star at The Capital Hotel in 1971 and more recently a CBE), he’s also a household name in the UK, hosting Ready Steady Cook, and a regular on Saturday Kitchen. Turner spoke to BBC Good Food Middle East about how he became a TV chef and why an appearance on This Morning with Richard and Judy kick-started his on-screen career. Where did your passion for food begin? It started when I was a child and my father returned from WW2, he was in the Army Catering Corps, and opened up his own transport café. I used to go along with him to the café on weekends and during school holidays and help out. It’s always been in my blood. What took you down the ‘TV chef’ route? Are there any dining spots you’re particularly fond of in Dubai and Abu Dhabi? Gary Rhodes at Grosvenor House in Dubai and The Club in Abu Dhabi are two places that I go to frequently when I’m in the region. However, for me the great thing is whenever I come back there are so many new restaurants to try. It’s an impossible task to try them all. You’ve worked with quite a plethora of impressive chefs during your career. Which experiences stand out to you the most? I have worked with lots of impressive chefs and many of these experiences stick out, particularly Michel Roux at the Royal Automobile Club in London cooking alongside a number of students. Secondly, the memory of Emil Jung at Au Crocodile in Strasbourg. He walked into the kitchen and had a taste of a sauce that was being cooked. He gave me a look, and then started throwing out ingredients to be brought to him. Bring a little of this, bring a little of that. He turned that sauce from something we all thought was great into something utterly amazing. What’s the most interesting trend you’ve seen introduced in the culinary industry recently? The industry has improved tremendously in lots of areas over at least the last 20 years. I think the desire to eat good street food is great, especially as someone who loves to eat with their fingers! What five ingredients will always be found in your kitchen at home? Butter, cream, parsley, very good sausages, and French bubbly. As an experienced chef, where do you find your inspiration these days? Are you still growing in the kitchen? I am very fortunate to be able to travel the world meeting exciting chefs and passionate gastronomes. Talking and tasting help us all to grow in the kitchen. As a TV chef yourself, who’s your personal favourite TV chef to watch? My great friend Rick Stein is fabulous to watch, and- in the nicest possible way – I always laugh when I watch Michel Roux. When can we expect to see you here again? Do you have any other exciting culinary ventures upcoming in the Middle East? I love coming to this part of the world and I now have many friends in the region. It is always a great way to switch off when I come to visit, so hopefully it won’t be too long until my next trip over here.